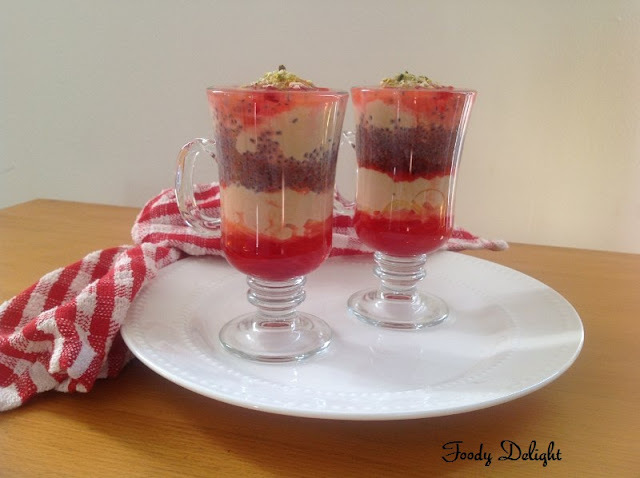 You can also check "Pistachio falooda"
Soak the basil seeds for 2 hours into 1/4 cup of water. Boil the falooda sev for 15 to 20 minutes into boiling water. When done, drain them and soak into cold water to avoid sticking. Heat the milk in a non stick pan on medium flame till the milk reduces to 1/3 of its quantity, while stirring and scrapping the sides of the pan continuously. Add the sugar and simmer on a medium flame for approx. 20 minutes or till the milk becomes thick. Remove from the flame and use in making falooda. 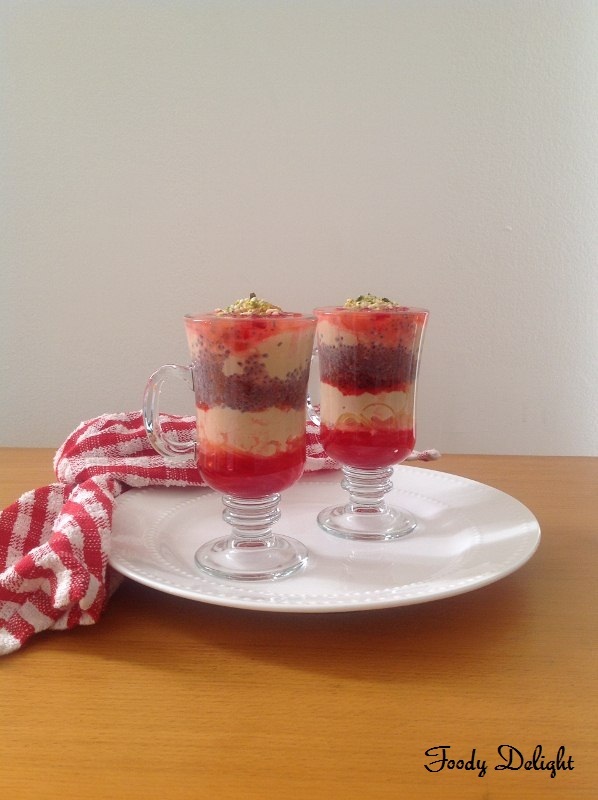 Place 1&1/2 tbsp of rose syrup in a tall glass, top with 1 tbsp of falooda sev, following with 2 tbsp of rabri and 1 tbsp of basil seeds, again with 2 tbsp of rabri. 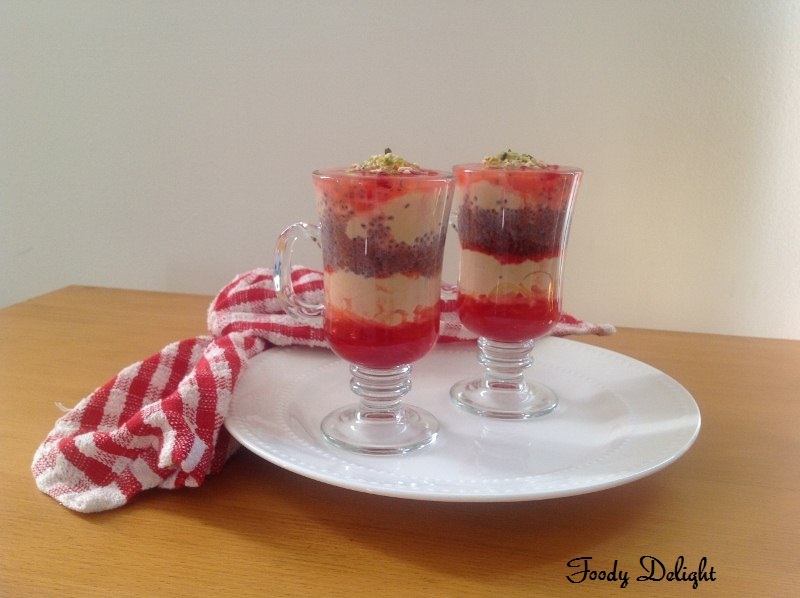 Lastly top with 1 tsp of rose syrup, 1 tsp of strawberry jelly and chopped pistachios. Repeat with the same ingredient to make one more falooda. its really rich and royal.. neat presentation..
You have a wonderful collection of recipes here. love that Falooda. -Visit me at Meg's Delicious Adventures in your free time. Super tempting dessert,looks absolutely divine and inviting.. Simply mouth-watering and delicious. Lovely presentation! !